Told in five extremely passionate and raw stories, Enigma Variations shines light on love's power. We are given a character who shows and holds onto love as an all-consuming warmth and coldness through several lovers from adolescence to adulthood. If you're not familiar with Aciman's ability to demonstrate an intense passion through the human psyche then you're in for an intimate and powerful ride with language that is almost lyrical, raw, and candid that will make you in tune with your own aches, desires, and the emotions that come from failure especially from your own memory of that first love and the ones that followed it. From André Aciman, the author of Call Me by Your Name (now a major motion picture and the winner of the Oscar™ for Best Adapted Screenplay) comes “a sensory masterclass, absorbing, intelligent, unforgettable” (Times Literary Supplement). 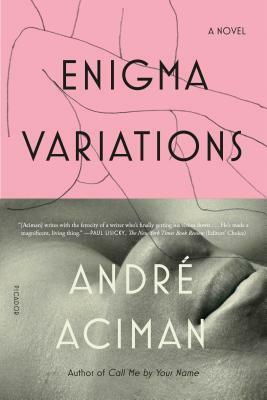 Enigma Variations charts the life of a man named Paul, whose loves remain as consuming and as covetous throughout his adulthood as they were in his adolescence. Whether the setting is southern Italy, where as a boy he has a crush on his parents’ cabinetmaker, or a snowbound campus in New England, where his enduring passion for a girl he’ll meet again and again over the years is punctuated by anonymous encounters with men—whether he’s on a tennis court in Central Park or on a New York sidewalk in early spring. Paul’s attachments are ungraspable, transient, and forever underwritten by raw desire. Ahead of every step Paul takes, his hopes, denials, fears, and regrets are always ready to lay their traps. Yet the dream of love lingers. We may not always know what we want. We may remain enigmas to ourselves and to others. But sooner or later, we discover who we’ve always known we were.